Thank you Andy Boy Broccoli Rabe for sponsoring this post! All photos, words, and opinions are my own. Herbs are difficult to measure by volume, so the herb measurements below reflect a loosely packed amount. I have found that firmly packing them would result in the 1/3 cup being more like 2 tbsp, but to be honest I never really measure my herbs when cooking since they're such flexible ingredients and ultimately it's up to your personal taste. So go wild if you love them or scale back if you don't. Asian grocery stores usually carry fish sauce, dried shrimp, and some of the harder to find ingredients. I also like to get my rice noodles there because they have a much wider variety to choose from than regular supermarkets/organic food stores. Serves 4 to 6 as a side or starter. Make the dressing by combining coconut milk, water, sugar, lime juice, fish sauce, lemongrass, and Thai chili. Whisk well until the sugar has dissolved. Set aside while you make the salad. Place oil in a small pan over medium heat. Once hot, add dried shrimp and garlic. Cook for 45 seconds to 1 minute, until fragrant but before the garlic starts browning. Transfer to a small heatproof bowl and set aside. Bring a large pot of water to a boil. Add rice noodles and cook according to package instructions (usually 4-8 minutes depending on thickness), taking special care not to let the noodles overcook as they’ll go from done to mushy very quickly. In the last minute of cooking, add broccoli rabe. When done, turn the heat off and immediately drain the noodles and broccoli rabe in a colander. Rinse thoroughly under cold water to prevent further cooking and remove any excess starch. 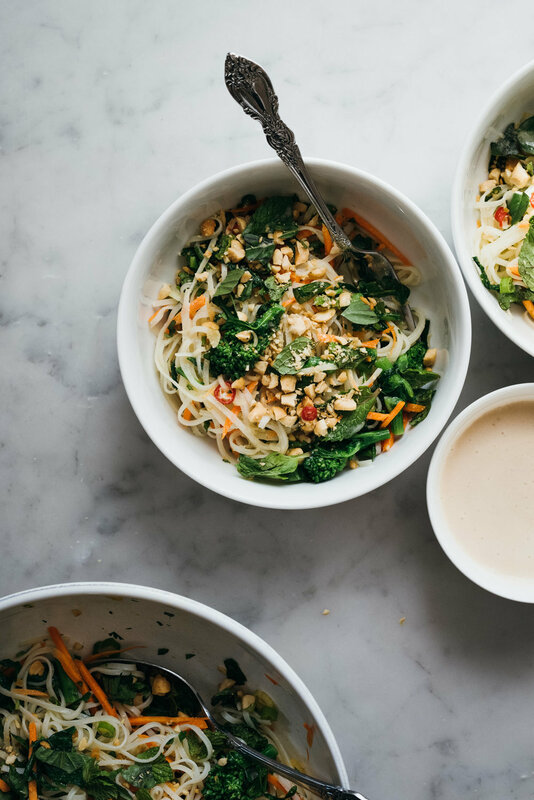 Place rice noodles, broccoli rabe, carrots, mint, basil, cilantro, and scallions in a large serving bowl or platter (reserving a small amount of mint and basil for garnish, if you wish). Add the shrimp/garlic oil and toss to coat. When you are ready to serve, drizzle the dressing over the salad and give it a light toss. Top with peanuts and reserved herbs, and enjoy immediately. Alternatively, to prevent the noodles from getting soggy if not eating immediately, you can serve the salad undressed, letting your dining companions add their own dressing in the amount they desire.